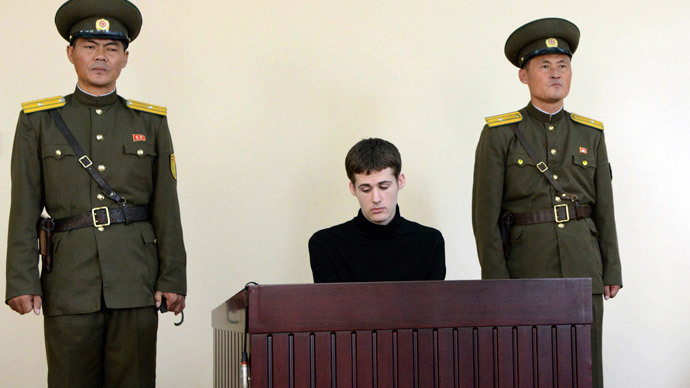 US citizen Matthew Todd Miller has received six years in a labor camp by a North Korean court. The 24-year-old was sentenced for violating his tourist status when he entered the country, authorities said. "He committed acts hostile to the (North) while entering the territory of the (North) under the guise of a tourist last April," the state-run Korean Central News Agency said in a statement. Miller tore up his visa upon arriving in North Korea and demanded political asylum, state media said at the time. The incident took place April 10. The court said Sunday that Miller was planning to "experience prison life so that he could investigate the human rights situation," AP reported. Miller has been refused to right to appeal following the brief court session Sunday morning. He isn’t the only US citizen being held in custody in North Korea. Jeffrey Fowle was arrested in May for reportedly leaving a Bible in a public place: spreading Christianity is viewed as incendiary in communist North Korea.